Welcome to our home in the quiet rural village of Souni Zanakia, off the beaten track yet close enough for you to be on the beach at Curium in ten minutes or on top of the Troodos Mountains in 55 minutes. We offer our completely self contained air conditioned studio apartment with its own shaded patio, garden and private entrance so you can come and go as you please. Many of our guests describe this studio as a "home from home" but if you don't feel like self catering or grilling on your gas barbecue there are plenty of nearby tavernas to eat in or take away (even fish and chips within one mile). Included is a day one breakfast pack with freshly baked bread, my home-made marmalade, free range village eggs and seasonal fruit.We have provided a list of recommended places to visit and places to eat that we tried and are on hand to help with any enquiries, free WiFi and free parking included. New flat screen TV with UK & Worldwide channels now available. New for 2019 is the kitchen refurbishment with new electric kettle, toaster, filter coffee maker, induction hob and air fryer, also new cooks knives and saucepans. 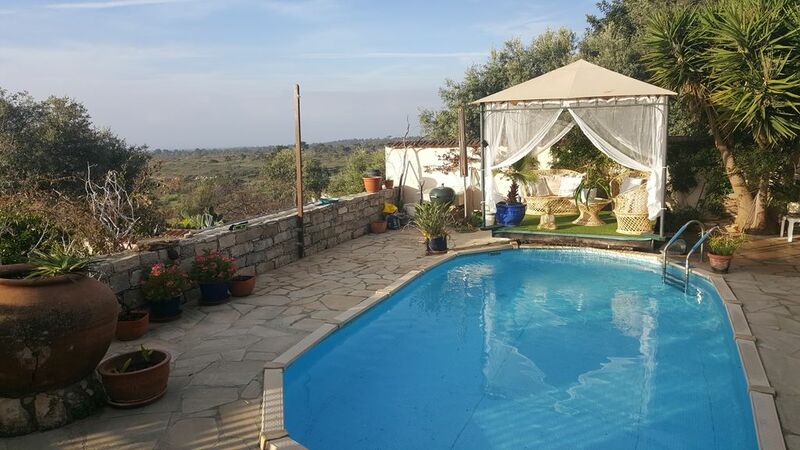 So sit and watch the swallows and bee-eaters swoop over the wooded valley with its awesome views to the sea at Akrotiri Bay or listen to the nightingales and nightjars in the warm dusky evening. It can be a heavenly experience for bird watchers to sit and spot the numerous birds migrating over the island. Pick your own breakfast grapefruit, the lemon for your G&T from the garden in season or savour the succulent figs in summer and enjoy your meal in the pergola in the fruit garden.You are also welcome to use our swimming pool in the garden above. The Studio is equipped with a generous king sized four poster bed but there is also space for a single bed if required. Just let us know. We retired to Cyprus in 2006 and found this beautiful renovated stone village house in wonderful countryside surroundings. It came with a very attractive studio apartment situated on the lower terrace adjoining the garden. Our village is a quiet and friendly place but close to the amenities of Epskopi and Erimi, Courium Beach and Museum is just 6 minutes away and you can be in Limassol in 15-20 minutes. Paphos airport in 30 minutes and Larnaca airport in 55 minutes. We're ideally centrally placed for access to the coast, the Troodos mountains and the golf courses at Aphrodite Hills and Secret Valley. We do our best to ensure our guests really enjoy their stay and are on hand if you want any advice on places to visit, the best places to eat that help you to experience the real Cyprus that we love. Central island location and beautiful surroundings, cooler up here in summer but near to all big city amenities of Limassol, quiet rural village location only six minutes from main motorway access. Large, cool studio apartment - 5m x 8m with own entrance stairway and large sunny patio terrace with the most fabulous views to the sea, use of private pool, ample free parking space and free WiFi. Flat screen TV with UK & World channels. Beach towels, beach mats and cool bag for picnics on the beach or wherever you care to go. Breakfast welcome pack includes home made bread, butter and marmalade, fresh village eggs, fruit from garden in season. Tea, coffee, milk and sugar. En-suite tiled bathroom with walk in shower, wash basin and wc, mirror and small chest of drawers. Air conditioner can be set to hot. Salt, pepper, tea, coffee, sugar. China cups, saucers, small plates, dinner plates , mugs, glass bowls.large glass salad bowl, small & large glass plates. Drinking glasses. Pots and pans, bowls, cutlery and cooks knives. Flat screen TV with Android box for UK & World channels. With two sunloungers and cushions, table and four chairs by apartment. Shade sail. Following a week in Coral Bay we wanted our second week to be completely different, more villages and mountains rather than bars and beaches. This garden studio in Zanakia hit the spot. Charming and quirky with a lovely terrace, stunning views, a very polite parrot and a dreamily affectionate dog. What’s not to love? The accommodation was spotlessly clean, simple but functional. This is not a modern holiday villa, but nor does it pretend to be. Hurrah for that, we loved it. Thank you so much for your positive review, we are delighted that you enjoyed your stay here. It's such a lovely area, it's so nice when our guests appreciate it as we do. Andrew, Audrey, Amber and Keo, the parrot. Cosy compact studio, rather small cooker in kitchen, disappointed that no broadband or TV whilst we were there, but understand that this issue is now sorted. Nice cool pool to relax after the heat of the day. Good central location for visiting the coast and the mountains, although the eastern end of the island too crowded for our likes, the exceptions (of the ones we visited) being the beautiful beaches at Ladys Mile, Limassol and Evdimou. The adjacent aviary was not too noisy, but we didn't really like to see free-flying birds cooped up all day. Information did not make it clear that air conditioning was metered. Had to sleep with light on to negotiate bathroom in the night because of loose wooden step to reach bathroom. Television could only play DVD - no channels. Had problems with ants and mosquitos and asked for assistance but was told it was to be expected in a hot country thus making eating outside unpleasant. Dead insects remained in the pool - so not very inviting. After the cockroaches arrived on the fifth day we decided to leave and find other accommodation. Audrey did provide a very pleasing welcome pack which we appreciated. We do understand that both her and her husband are having serious health problems at the moment but if they are unable to present the accommodation as advertised the description should be modified accordingly. We have photographs if required. John and Pat complained from the moment they arrived, they took the wrong road from Larnaka airport and blamed our directions - they are the only guests who have ever done this. When I showed them the apartment I told them that the tv only played DVDs of which we have well over a hundred available. (There is now an Android box which gets UK and World tv channels). This is also mentioned in the website apartment description as is the metered air conditioner - TWICE but they didn't read this. There is also an electric fan available if you don't wish to use the airconditioning. The apartment has a sliding flyscreen door, an electric mosquito plug deterrent and a mosquito net around the bed so we don't have mosquitos or flies inside. John and Pat don't mention that they broke a large bottle of olive oil on the kitchen floor, this was not cleaned up properly, broken glass was found under the kitchen cupboards when we cleaned the apartment. They complained of ants in the garden and we said this was normal for Cyprus but because of the oil two days later there were ants in the kitchen and one cockroach. These insects love food and oil! We have had no insects inside before their arrival and none since. Coffee was also spilled on the floor, bedside rugs and the duvet cover. Also makeup on the duvet cover. We always get insects in the pool at night, these are scooped out in the morning and then the pool filtration is switched on before they use the pool, they even said the pool was too cold! We do have weeds in the bottom fruit garden, my husband is recovering from a knee replacement operation and is unable to weed it and our gardener was not available at the time of their stay. When they sat outside in the evening obviously there were mosquitos, I suggested buying a mosquito repellent locally but was told she had Jungle Formula repellent at home and wasn't going to buy any more! I did provide a citronella candle. There are two bedside lights and a torch available so there is no need whatsoever to sleep with the light on to use the bathroom at night. The meet and greet from Audrey and Andrew was very friendly and very helpful with a lot of useful local information. The apartment was comfortable but a bit more basic than we had imagined. Thank for your review, we were very surprised by your "basic" description of the apartment, it is exactly as shown in our photos. The aviary is mentioned in the description too, the majority of our guests really enjoy the birds and liken it to being in the rain forest. If you had raised the sound issues whilst you were here we could have done something about it. Warm welcome from our hosts on arrival. Apartment located in a quiet village a short drive from beaches, restaurants and supermarkets and contains all the essentials needed for a 'self contained' stay. Great choice if you wish to escape the hustle & bustle of the popular resorts. So delighted you enjoyed your stay here and we hope to see you again soon. Audrey & Andrew. Well equipped apartment and patio area. Hosts Audrey and Andrew were very helpful. As nature lovers we had plenty to talk about and loved seeing the aviaries. Location is well positioned for visiting lots of the sights; an hour to Paphos and 20mins into Limassol. Beaches close by. Thank you for your hospitality. Thank you for your kind review and for the fantastic photos. This quiet and peaceful area is extremely interesting to any keen bird watchers, many migratory birds visiting Cyprus are seen in the garden and reserve. Bird watching trips can be arranged. The area is very suitable for kite and wind surfers at Kourion Beach, walkers and mountain bikers would also enjoy the wild game reserve. We are keen bird watchers and naturalists and keep exotic birds in a large aviary in the garden which can be viewed by guests. It takes about six minutes to drive to Courion beach and ten minutes to Melanda beach. Courion is safe for swimming, has 3 tavernas for lunch or refreshments. Melanda beach is further around the bay, slightly rocky but very peaceful. Lady's Mile beach is 20 minutes away but has a long sandy beach and safe, shallow swimming as well as several tavernas on the beach. We are 25 minutes from Paphos Airport and 55 minutes from Larnaca Airport. A hire car would add considerably to the enjoyment of your stay, we can recommend a very reliable local firm who can arrange for your car to be at the airport. Distance to Souni - 2kms, to Episkopi and Erimi - 8 kms. Kolossi - 12kms, Limassol - 18kms, Paphos - 58kms. There is a coffee shop in the village and a kebab shop on the crossroads, a taverna/pub/shop at Souni also a tearoom and small supermarket. There are supermarkets, bakeries, bank, pharmacies, filling stations, restaurants, pubs and take aways in Episkopi and Erimi - 5 minutes by car. Major supermarkets and shops are available in Limassol 20 minutes by car. There are several historical sites in the area including the mosaics, amphitheatre and museum at Courion or a visit to Kolossi Castle. Leisure activities include horse riding and wind surfing at Kourion, go-carts at Episkopi, the water park at Fasouri, bird watching at the Salt Lakes, walking and mountain biking in the reserve. Visits to the various wineries on the Cyprus Wine Trail and the Wine Museum at Erimi and a new micro brewery, Aphrodite's Rock at Paphos.The Monastery and attractive village of Omodos are also well worth a visit. Booking Notes: To book - book online. If you have any queries please contact the owner by phone or email to discuss details. If you cancel your booking up to four weeks before the arrival date, your payment will be refunded if the apartment is able to be rebooked. If you cancel after the four weeks your payment will be forfeited if the apartment is not able to be rebooked. Changeover Day: Changeover day is flexible. Notes on prices: Prices are for the property per week in UK Pounds. Euros also accepted at current exchange rate. Price for a third person staying in the apartment is £140 extra per week. Water, electricity and gas are included in apartment price but air-conditioning and winter heating are a small metered charge of €1 for one hour. For long winter lets there is a 5% discount.